VAUGONDY - Imperii Occidentis Tabula synoptica. VAUGONDY, R. DE - Imperii Occidentis Tabula synoptica. 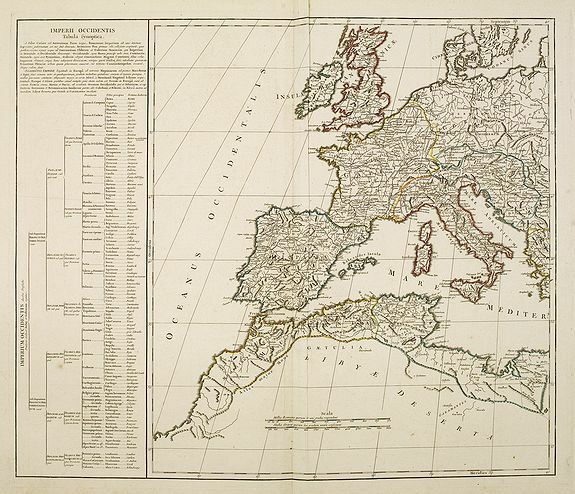 Title : Imperii Occidentis Tabula synoptica.. Size : 19.1 x 22.6 inches. / 48.5 x 57.5 cm. Description :Map of the Western part of the Empire of Julius Caesar. The map includes Western Europe, up to the east coast of Greece. With the western part of the Mediterranean with the north coast of Africa. On the left a table with Latin names of the different ancient regions and towns with their translation into modern toponymy.